The SALT was developed during the thesis of Erell Olivo : “conception of a photobioreactor in a hatchery” in 2007. It was then implemented in a second thesis written by Julie Marchetti on the “integration of a continuous culture of microalgae in a commercial shellfish hatchery” in 2012. This technology has also been the base for several scientific publications. The patent pending technology is integrated in all the Synoxis Algae’s products: NANO, LUCY and JUMBO. Our systems obtain microalgae concentration up to 20 times superior than with traditionnal systems. 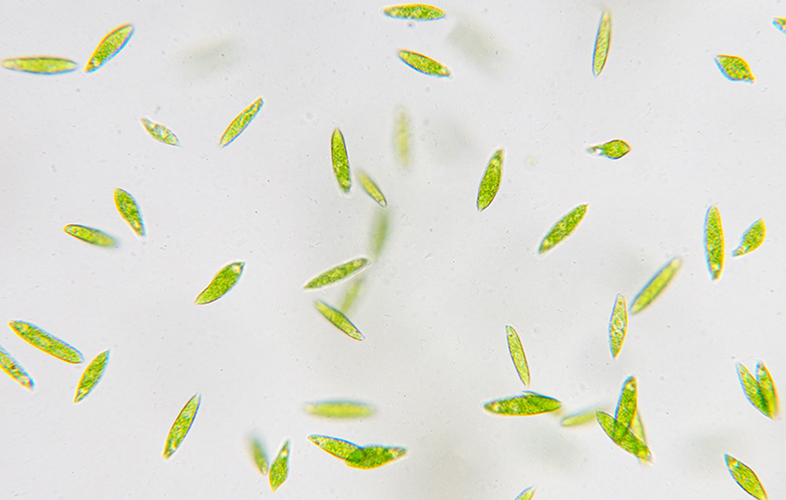 The microalgae receive the optimum quantity of light, nutrients and gas to develop rapidly and efficiently. For example, LUCY obtains a concentration of Chlorella Vulgaris of 500 million of cells per milliliter, a 130 millions of cells per milimiter for Isochrysis Affinis Galbana and 4 grams of dry mass per litre for Althrospira platensis (spirulina)*. Our cultivation systems are studied to offer the microalgae a homogeneous exposure to light and to prevent the natural phenomenon of self-shading. The productivity of our systems is also due to the continuous supply of nutrients. The advantage of our systems is that this productivity is possible in a reduce space thanks to its vertical and tubular design. The space is taken within the height and not on the ground. Our products are designed to work as batch, semi-continuous or continuous mode for several months. 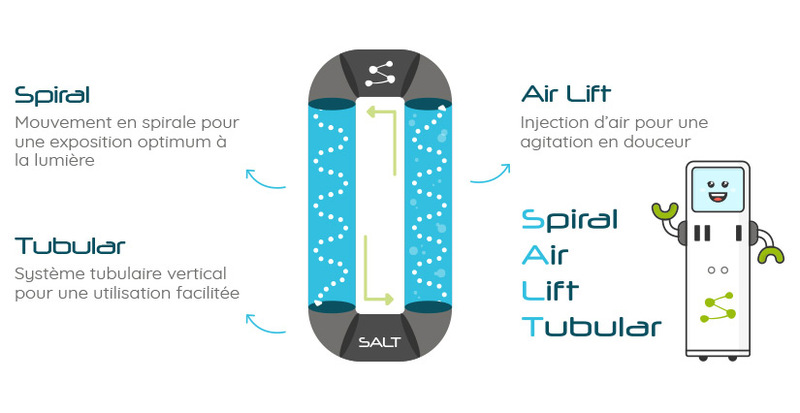 The spiral movement with air lift of our SALT technology increases gently the speed of the fluid on the side of the tubes and produces a smooth agitation. This way, the formation of the biofilm is prevented and the longevity of the culture is increased. 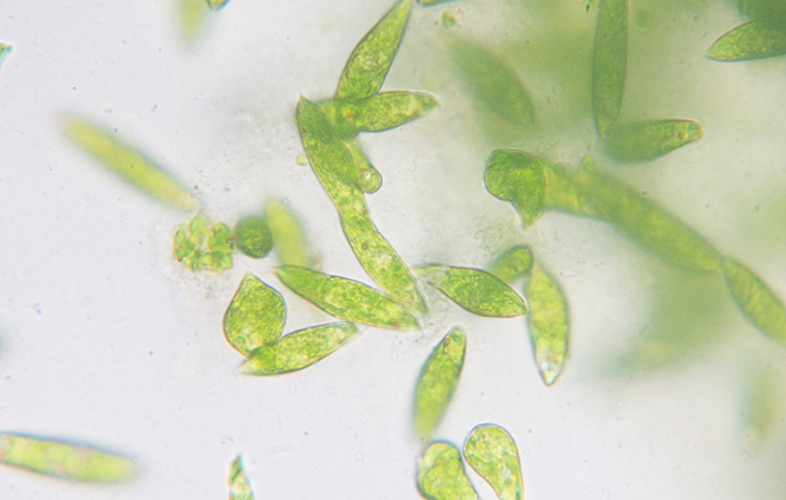 Arthrospira platensis (Spirulina), Isochrysis galbana affinis Tahiti, Chlorella, Skeletonema costatum, Chaetoceros vulgaris, Rhodomonas salina, Chlorella autotrophica, Nannochloropsis gaditana, Cylindrotheca closterium, Odontella aurita, Phaeodactylum tricornutum, Porphyridium. One of our services is to test your microalgae with LUCY in our laboratory and to deliver you a full report of the results. Do not hesitate to contact us to learn more about this service. Cultivating in a closed system protects the culture from external contamination risks. We develop sterilization protocols to launch your cultures in the best conditions. Furthermore, our cultivation systems are designed for an easy and efficient maintenance.